A bridge is one of the options to replace one or more missing teeth. It is a permanent fixture which is anchored to the adjacent natural tooth or teeth (the abutment) to ‘bridge’ the gap where the tooth (or teeth) is missing (the pontic). This also prevents the adjacent natural teeth from drifting.A bridge is a great option if you do not wish to have dental implants or a denture to replace your missing tooth or teeth. 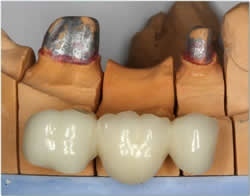 There are many different designs and materials which can be used for bridges: your dentist will discuss the best option for you.Each bridge is individually handcrafted by our dental technician to create a healthy, natural look which also sits comfortably with your bite.